For me, I think this was one of the few Coen brothers films that I have never heard of (there are a few, but they have made just so many). It’s one of my less favourites. There is an elderly black woman, Marva Munson (Irma P. Hall), highly religious, who lives in a large house with a ‘root cellar’ (a cellar with dirt walls). A very odd man, “Professor Goldthwaite Higginson Dorr, takes a room upstairs and uses the root cellar for rehearsals of his medieval music ensemble. Without the knowledge of Munson, they are not rehearsing but planning to rob a nearby casino, tunneling in from the root cellar. Things do not go well. 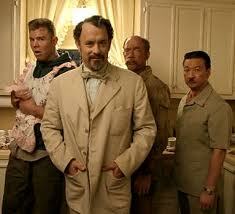 It’s an excellent cast, and some excellent, over-the-top character acting from Hanks and many of the others. The story is alright, although it really only kicks in for me in the last half an hour or so. I learned that this is actually a remake of a 1955 film featuring Peter Sellers – I want to check that one out.